This morning, I read the lengthy obituary for former Beatles engineer and Pink Floyd signee Norman Smith in the New York Times. I was shocked to discover that this man, who had such an influential role in 60's rock and psychedelia production, was the singer of the early 70's novelty hit, "Oh Babe, What Would You Say?" It's hard to believe that the man who worked with producer George Martin on every Beatles song from 1962 through 1966, and then signed Pink Floyd to EMI Records and went on to produce their first two albums sang this campy silly hit song that was about as far from rock and roll imaginable. The early 70's was a field day for novelty hits -- the British ate them up -- and "Oh Babe, What Would You Say" fit right in the mold of left field success. I should devote a whole blog posting to some of them: C.W. McCall's "Convoy," Loudon Wainwright III's "Dead Skunk," everything ever played on the nationally syndicated "Dr. Demento" radio show, The Pipkins' "Gimme Dat Ding," Ray Stevens' "The Streak" and "Gitarzan," and the audio clip job from Buchanan & Goodman, "The Flying Saucer." "Oh Babe, What Would You Say" sounded like it was recorded in the late 40's or early 50's, a British dance-hall type mid-tempo number with a cheesy orchestra, sweeping jazz drum brushes, and Hurricane Smith crooning on the verge of being in on the joke, his voice slightly pinched to sound like it's coming through a megaphone. It as the kind of song you imagine your grandfather danced to when he came home from the war. Paul McCartney composed and sang dance hall-influenced numbers which were either ignored or despised by Beatles fans, like "Honey Pie" (White Album) and "You Gave Me The Answer" (Venus and Mars). Despite "Oh Babe, What Would You Say" sounding like an out of left field wedding song from another era, it actually climbed high onto the charts. 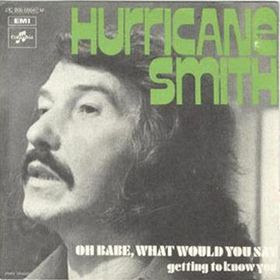 I never knew who Hurricane Smith was, and frankly he could have been the same guy who pretended he was Jethro Tull. Was it a catchy song for what it was? Sure, like the way Glenn Miller's "In The Mood" was. In keeping with the corny theme, I have two videos below to salute Hurricane Smith -- one is a montage of classic cars with a few photos of Smith cut in, and then an absolutely cheeseball 1973 black and white clip of an entertainer singing the tune in French wearing an outfit right out of a Jerry Lewis movie. I really like 'Oh Babe, What Would You Say'. It's catchy and poignant at the same time. To say that it has nothing to do with rock is, to me, to miss the point of it. Norman Smith came from an earlier generation and this kind of old-fashioned songsmithery was his musical roots. Roger Waters is quoted as describing Smith as 'an old-school song and dance man'. Yet at the same time Smith saw a commercial opportunity for this kind of revivalist song, which nevertheless has enough touches in the production, vocal delivery and sound to make it much more than pure pastiche. In my opinion it's a work of genius and clearly it struck a chord with listeners and buyers at the time, many of whom were perhaps that little bit older and could relate to the sound it referred to.